To get what you want, you have to deserve what you want. It's not given to human beings to have such talent that they can just know everything about everything all the time. But it is given to human beings who work hard at it ? who look and sift the world for a mispriced be that they can occasionally find one. And the wise ones bet heavily when the world offers them that opportunity. They bet big when they have the odds. And the rest of the time, they don't. It's just that simple. That is a very simple concept. And to me it's obviously right based on experience not only from the pari-mutuel system, but everywhere else. And yet, in investment management, practically nobody operates that way. We operate that way ? I'm talking about Buffett and Munger. And we're not alone in the world. But a huge majority of people have some other crazy construct in their heads And instead of waiting for a near cinch and loading up, they apparently ascribe to the theory that if they work a little harder or hire more business school students, they'll come to know everything about everything all the time. To me, that's totally insane. The way to win is to work, work, work, work and hope to have a few insights. How many insights do you need? Well, I'd argue: that you don't need many in a lifetime. If you look at Berkshire Hathaway and all of its accumulated billions, the top ten insights account for most of it. And that's with a very brilliant man Warren's a lot more able than I am and very disciplined devoting his lifetime to it. I don't mean to say that he's only had ten insights. I'm just saying, that most of the money came from ten insights. So you can get very remarkable investment results if you think more like a winning pari-mutuel player. Just think of it as a heavy odds against game full of craziness with an occasional mispriced something or other. And you're probably not going to be smart enough to find thousands in a lifetime. And when you get a few, you really load up. It's just that simple. Parker (NYSE: PH) is a global leader in motion and control technologies, providing precision-engineered solutions for a wide variety of mobile, industrial and aerospace markets. Parker can be found on and around everything that moves, including aerospace, climate control, electromechanical, filtration, fluid and gas handling, hydraulics, pneumatics, process control, sealing and shielding. PH's Industrial business makes valves, pumps, filters, seals and hydraulic components for a broad range of industries, as well as pneumatic and electromechanical components and systems. It has two segments -- Industrial North America (43% of FY 2014 sales and 51% of operating profits) and Industrial International (40% and 33%). Sales through distributors account for about half of PH's total industrial business. The third segment is Aerospace (17% of sales and 15% of segment operating profits) which primarily makes hydraulic, pneumatic and fuel equipment used in civilian and military airframes and jet engines. It is noticeable that for Parker, replacement part sales are generally more profitable than original equipment sales. A friend asked me to do an analysis of this stock, I look into the company and immediately attracted by its strong cash flow, healthy earnings per share, and organic dividend growth. As usual, I'll use my stock purchase criteria as the analysis basis. Our capital allocation priorities remain the same, as they have been in the past, with our top priority to maintain our dividend increases. As you know, our dividends have been raised for 58 consecutive years. We have increased the dividend 31% this year. We announced that last quarter. And we've raised dividends 150% in the last five years. So you can see that the priority that we've put on dividends is significant. Our risk assessment reflects the highly cyclical nature of the company's industrial and aviation markets, volatile energy and materials costs, and a competitive environment. This is offset by our view of PH's favorable earnings and dividend track record, as indicated by its well-above-average S&P Quality Ranking of A.
PH's beta is 1.69, reflecting its highly cyclical nature of the company's industry. 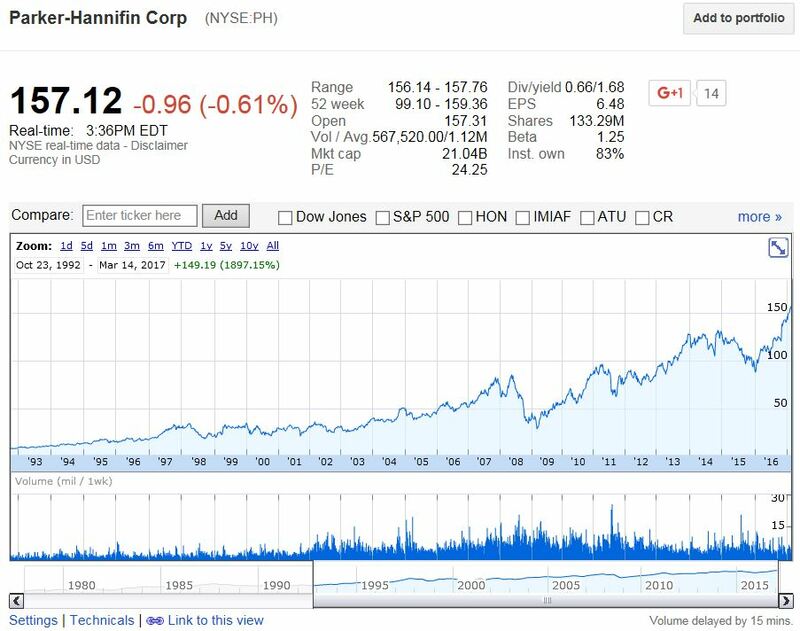 It is also seen from below stock price history that PH is much more volatile than its competitor Honeywell (NYSE: HON), not to mention compared to S&P 500. After analyzing key regional market trends and segment trends, Chairman of the Board Donald Washkewicz is optimistic about Parker's outlook by saying, "yes, there is some headwinds that we have, but the nice thing is, as Parker is so broad based in so many different market segments, there's some nice tailwinds as well that are offsetting some of the headwinds that we are seeing." Parker's current dividend yield is 2.10%, lower than my 3% criterion. However, PH's dividend growth rate (DGI) is pretty high, with 10-year average DGI at 15.1%, and 5-year average at 15.7%. At these fast average growth speeds, it will take PH around 12 years to reach annual return 10%. With such high DGI, Chowder number is attractively calculated at 17.8%. Currently PH's dividend payout ratio is only 28.50%, which leaves a large room for further dividend increases. Parker's EPS growth is healthy and stable, well above dividend payments. Free cash flow remain healthy and strong, from the Q2 earnings release, Mr. Washkewicz made these impressive comments regarding free cash flow, "We expect fiscal 2015 to be our 14th consecutive fiscal year, where cash flows exceed 10% of sales and we're very pleased with that record performance as well. In addition, this is also expected to be our 14th consecutive fiscal year, where free cash flow is greater than net income." Parker is very aggressive at share buyback program. In last October PH announced a new authorization for the purchase of $2 billion to $3 billion in shares over two years. Until the second quarter ended in Dec, the company has purchased a total of $1.2 billion shares since the October announcement. The average price that they paid for the $1.2 billion was $126.5. And the ending share count at the end of the quarter was 148.7 million. While they continue to look for strategic acquisitions going forward, $2 billion is their committed minimum amount for the share repurchases, as confirmed by the newly elected CEO Thomas Williams. 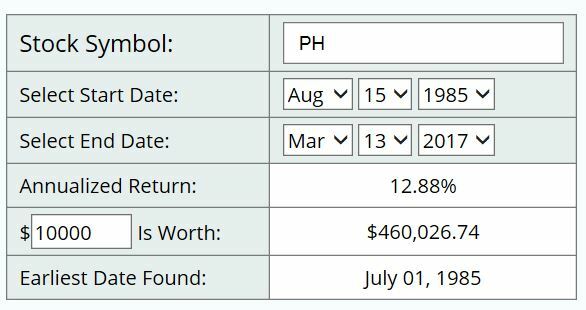 If we review the history, PH's outstanding shares has dropped from 180 mil shares in 2005 to 150 mil shares TTM. It is noticeable that Parker issued $1.5 billion long-term bond in November; proceeds from the bond issuance were used to fully repay commercial paper outstanding in the amount of $702 million. The additional incremental stock buybacks will mainly be funded through operating cash flow. Given current long-term debt to equity ratio at 47% (MorningStar data), I am not too worried about this bond issuance. The fact I like PH most is about its business model & products character that "replacement part sales are generally more profitable than original equipment sales." This gives PH a lot of resilience no matter the macro economy is going upwards or downwards. On the one hand, if economy goes up to north, new OEM projects and net sales will be surely expected. On the other hand, even if economy goes towards south, the company's replacement part sales will instead increase compared to regular says and a certain profit level is kind of warranted. S&P Capital gives PH the 12-month target price at $153, fair value price at $131.90, and a "buy" recommendation. The analysts believe $153 target price is warranted given their view of PH's operating leverage potential and strong free cash flow generation track record. Yahoo's 1 year target price on this stock is $130. Current market price is $118 (on 04/02/15), which is about 9.2% discount. I would plan to add in some PH shares when market price reaches around $110, which offers me comfortable safety margin and decent upward cushion.